I'm a big fan of responsible credit card use. (Unlike some financial “gurus.”) With a few cards offering 5% cash back and most good credit cards offering 1-2% back on purchases, those reward points can add up quickly for spending you were already going to do anyways. Just last week we took a last minute trip to Florida to spend time with my grandparents. The total airfare cost would have been over $1000. However, by cashing in our Chase Sapphire Preferred points, we were able to do it for less than $400. The problem with this is you may spend more than you have in your checking account. Credit cards balances can get confusing, with “Pending Transactions,” “Current Balance,” “Minimum Payment,” “Statement Balance,” and all kinds of other terms designed to confuse you so you miss a payment and give the credit card companies their interest and fees. If stolen, your debit card can be used to empty your checking account. While you’ll get the cash back eventually, it can be a painful process and is not as easy as when your credit card gets stolen, because your credit card doesn’t have direct access to your checking account. Debit cards don’t offer the cash back and reward points that credit cards do. So how to get around this? How can I put all my payments on my credit card while still knowing exactly how much I have left to spend until the next paycheck? My wife came up with the brilliant idea of the Bills account. 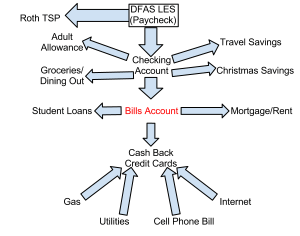 The Bills account is a second checking account that you make all of your bill payments and credit card payments from. The beauty is in its simplicity and also how it reduces the risk of overdraft, over spending, and spending money we don't have. Also, don't link a debit card to it. Only keep a debit card linked to your primary checking account. That way you can only spend the money in your primary checking account, not the money earmarked for bills in the Bills account. The idea of the Bills account is simple: every time you make a credit card purchase, immediately move the money from your checking account to your Bills account. That’s it. No messing with spreadsheets or post it notes to remember how much you’ve spent so far that bill period. Just move the money immediately (within a few minutes if you’re shopping online or when you return home if you're out and about) and the money you see in your checking account is exactly how much you have until the next pay period. This is great for making twice monthly payments on your credit card, which I highly recommend. Just pay your “outstanding balance” on your credit card every time Uncle Sam cuts you a paycheck (1st and 15th of the month) and you’ll never pay the credit card companies a dime in interest or fees. The Bills account is also great for capturing money for bills that are paid monthly, like rent, mortgage, cellphones, electricity, car payments, etc. If you have a bill that is monthly and you are paid twice a month like military members are, then set aside half the bill in one paycheck and the other half in the next paycheck so you aren't hurting as badly when the bill comes due once a month. This adds up to $2710 per month. So every paycheck I receive (on the 1st and 15th), I transfer $1355 into my bills account, automatically. When my mortgage payment comes due, an automatic electronic funds transfer comes out of my Bills account. Same thing with my HOA dues and student loans. I know the money is in there because it went in automatically. I never have to fear overdrafting or missing a payment. I put all my gas purchases on my credit card. Sometimes, it’s $160 per month. Sometimes $220. But over the long run it averages out to just under $200. So when I go to pay off my credit card bill with the gas on it, I know the money for the gas is in the Bills account. And, because I’ve transferred every purchase immediately from the checking account to the Bills account, I know that the entire credit card payment is ready to go in my Bills account. No messing with spreadsheets. 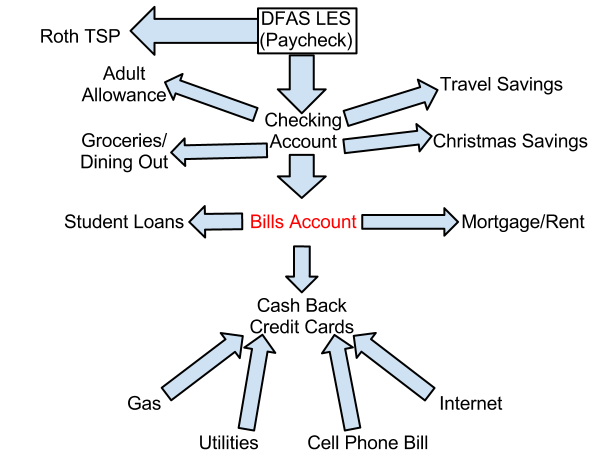 Just immediate situational awareness of your financial situation by looking at your checking account balance. How about you? How do you manage to keep your credit card paid on time? Anybody else use something similar to the Bills account?